Chocolate Banana Chia Seed Smoothies — these creamy, delicious, protein-rich smoothies are perfect for an easy and healthy breakfast or snack any time of day. I cannot get enough of chia seeds, I just love them. They are a super food, full of omega-3 fatty acids, protein, antioxidants and fiber and they are so versatile. 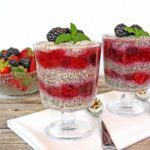 Ever since I first tried chia seeds this past January, I’ve been having a lot of fun creating recipes using chia seeds. So far, I’ve shared my Coconut Almond Chia Seed Pudding and my Orange Creamsicle Chia Seed Parfaits. 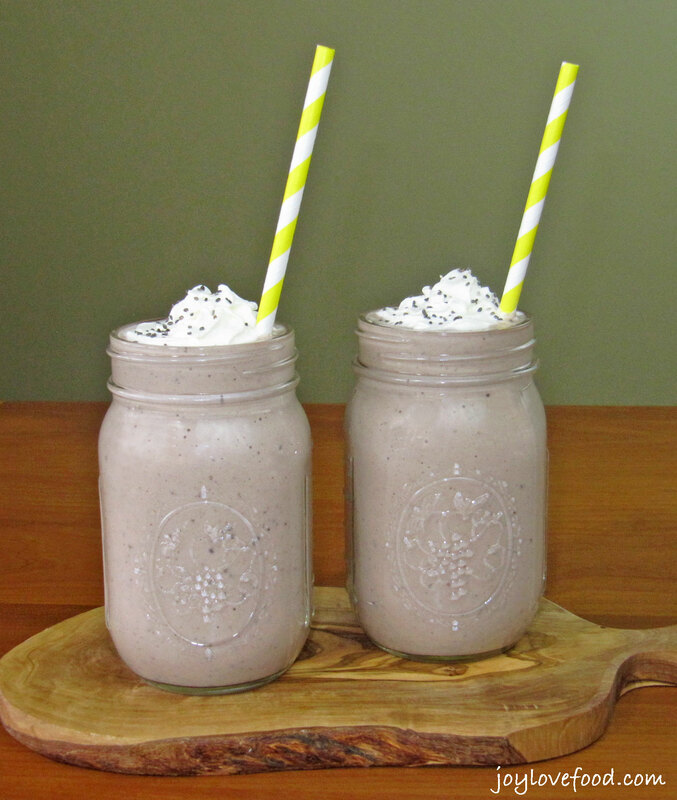 Today I’m sharing my Chocolate Banana Chia Seed Smoothies. I’ve been wanting to use chia seeds in a smoothie, and thought I’d start with adding them to one of my favorites, the chocolate banana smoothie. 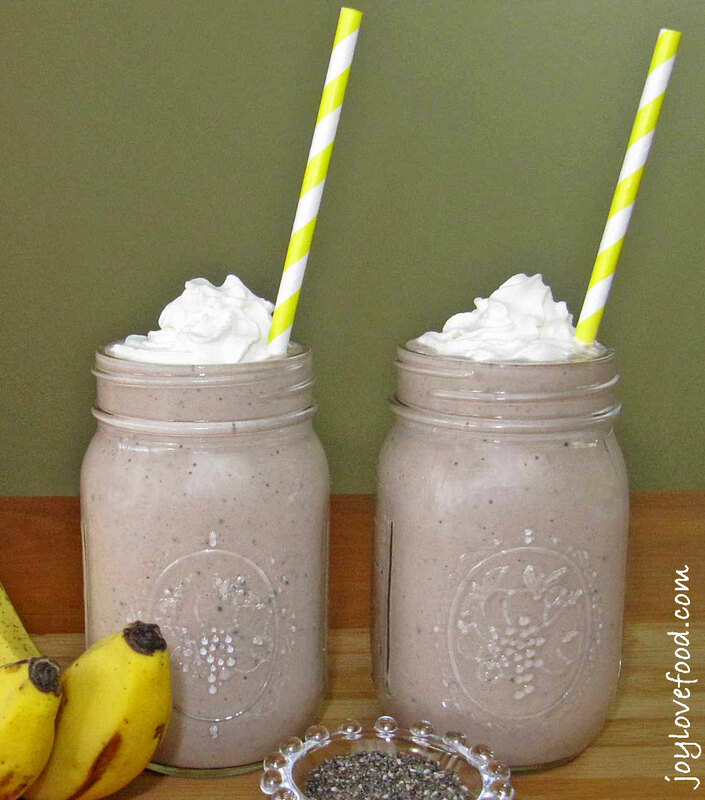 Chocolate banana smoothies are so delicious, easy to make and are my go-to smoothies because I tend to have the ingredients on hand to make them – cocoa powder, frozen banana chunks, vanilla Greek yogurt and milk. I thought chia seeds would be a wonderful addition and they most certainly are. I typically buy a bunch of bananas a week. Sometime they all get eaten, sometimes they don’t. I let any leftover bananas reach their peak ripeness and then either, freeze them whole in their peels – to be used later for baking – or I peel them and cut them into chunks, to be frozen and used in smoothies. I first place the banana chunks on a plate, in a single layer, cover in plastic wrap and place the plate in the freezer. Once the chunks are frozen, I remove them and place in a resealable bag which I store in the freezer. I just keep adding to the resealable bag as I acquire over ripe bananas and use the frozen banana chunks as needed. I love using frozen banana chunks in smoothies because then you don’t need to add ice to your smoothies, which can melt and water them down. Frozen banana chunks make for really creamy, luscious, smoothies, but without adding any fat. Cocoa powder provides the chocolate flavor, again without any added fat. I like using Greek yogurt because it is thicker and contains more protein than regular yogurt. The chia seeds don’t affect the flavor; instead they just add additional nutrients including protein, fiber and anti-oxidants, making a healthy smoothie even healthier. These delicious, creamy, Chocolate Banana Chia Seed Smoothies are wonderful for a healthy, easy breakfast or snack any time of day. What is your go-to smoothie? Please let me know in the comments below! Chocolate Banana Chia Seed Smoothies -- these creamy, protein-rich smoothies are perfect for a delicious, easy and healthy breakfast or snack any time of day. Add frozen banana chunks, vanilla yogurt, milk, chia seeds and cocoa powder to blender. Pour into 2 mason jars or glasses of choice. Top with whipped cream and a sprinkling of chia seeds if desired. 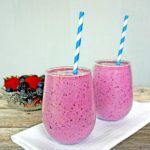 This entry was posted in Beverages, Breakfast & Brunch, Healthy Snacks and tagged banana, breakfast, chia seeds, chocolate, healthy, recipe, smoothie. This is a great recipe that’s really close to our “go to smoothie”! Have you tried some overnight oatmeal in this? Overnighting some oats in the plant milk then adding all the ingredients to the blender in the morning gives a ‘soft serve’ creamy consistency. Chocolate for breakfast is always the right choice…especially when it is so healthy. Hi, thanks, I haven’t tried adding oatmeal, sounds like a great addition! Joy, I love your recipe – so much that I had to try it right away. However, I didn’t have all the ingredients and needed to improvise and ended up with a different version. I’ve linked to your post and recipe. Frozen banana chunks make amazing smoothies!! Thanks for sharing. Banana smoothies are a regular at our house but I haven’t tried chia seeds before. I have recently read that omega 3 can be lacking in children, especially boys, so this could be a good way to improve their nutrition. Found you on loulougirls link party. Hi Karen, thanks so much for coming by! I hope you give this a try and you and kids enjoy! Elaine recently posted…Strawberry Poke Cake! Thanks Cydnee! This is indeed a wonderful way to start the day! Thanks Angela! Hope you give this a try and enjoy! Your Chocolate Banana Chia Seed Smoothie looks delicious. Thanks so much for sharing your awesome post with Full Plate Thursday and have a fantastic weekend! This looks great. Perfect for breakfast. Thanks Michelle! This is indeed wonderful for breakfast! 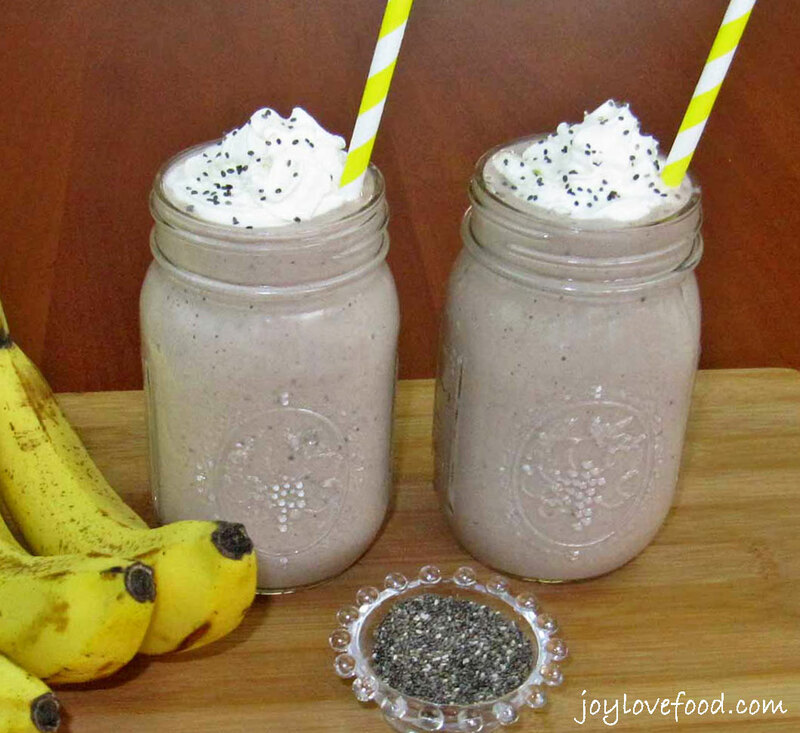 I tried this and this chocolate banana chia seed smoothie is excellent! Highly recommended! This looks amazing and such a good option for breakfast . Oh yumm! Banana & chocolate, what could possibly beat that?! Thanks Sarah! I just love banana and chocolate together! I have never tried chia seeds…it’s on my list of things to do and this seems like it would be a great way to test! Could I ask which social media sidebar you use? I want yummly to appear in mine too! Thanks! Going to be having this for breakfast after Easter! Oooh this looks amazing! Tasty and full of goodness, what more could you want in a smoothie! I haven’t made any smoothies for such a long time, but I usually have mine with some spinach in and usually always banana in there! Thanks Michelle! Spinach sounds wonderful, I need to try that soon! I put chia seeds in my smoothies all the time! This chocolate banana combination is fantastic! 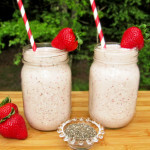 Chia seeds are wonderful to add to smoothies to really pack a fiber punch. I add them often to my morning smoothie to help keep me fuller longer. Thank you for the new recipe. This looks amazing! I always have ripe bananas and dont know what to do with them! Now I have another option as I usually do banana loaf! Thanks Merlinda! I hope you give this a try and enjoy! Thanks, this is the perfect healthy start to the day! Have never eaten chia seeds before. Will see that that fact changes soon!! Great photos. Thanks so much Patricia! I hope you give chia seeds a try soon and enjoy! Everyone in our house loves Smoothies, so we will definitely be trying this very soon. Thank for sharing, have a wonderful week! 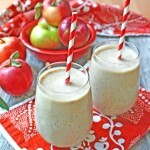 You chia smoothie looks wonderful!!! Miss you in our WW, do stop by and link and share!! Sounds really yummy. I don’t think there are chia seeds here in New Zealand. Thanks so much! I hope you give it a try and enjoy! I’ve been wanting to try chia seeds! Incorporating them into a smoothie seems like a great way! Thanks Jamie! I hope you give it a try and enjoy! Kim, thanks so much for coming by and for the pin! I love chia seeds! What a great smoothie! Love chia seeds, especially in smoothies! This one looks so delicious! Pinned! Thanks Stephanie! Frozen banana chunks are the best! Thanks Liz! Hope you give the chia seeds a try and enjoy! Hi Cindy, your smoothie sounds delicious! 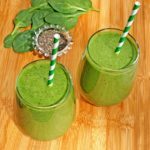 I have yet to try adding greens to my smoothies, I will have to try it soon! Thanks so much for coming by! Thanks Dorothy, this would be great for an after school snack!